While Historical GIS (HGIS) has become a familiar approach in the social sciences and humanities (Gregory and Geddes, 2014), recent trends in the social science use of GIS have called for HGIS implementations that can apply Big Data-based HGIS approaches to more qualitative research questions and, perhaps most importantly, more closely involve the public. Approaches range from allowing users to contribute to HGIS research using improved web interfaces, such as the New York Public Library’s Building Inspector, to the expansion of qualitative HGIS research (Olson, 2011; Lafreniere and Gilliland, 2015). In the broader world of GIScience, researchers have developed hybrid qualitative/quantitative tool combinations that expand the research potential of GIS further still (Kwan and Ding, 2008; Jung and Ellwood, 2010); these have more recently become topics of interest in the HGIS community as well. As part of this trend, Michigan Technological University’s Historic Environments Spatial Analytics Lab (HESAL) is preparing to launch the Keweenaw Time Traveler project – combining the latest generation of historical spatial data infrastructure with Web 2.0 technology and public outreach in ways that foster closer connections between research and the public by making history both fun and accessible. The Keweenaw Time Traveler Project (KeTT) brings to the public a regional HGIS focusing on the Copper Country of upper Michigan, a region of the Midwest USA that contains the world’s largest deposits of nearly pure elemental, or native, copper. Native Americans exploited this resource for thousands of years; a subsequent industrial copper boom in the mid 19th century led to the area becoming the world’s largest supplier of copper by the 1880s, with a rapidly growing population and massive mining infrastructure quickly built in what had been a remote, if beautiful, wilderness. By the end of WW I, economic factors coupled with the growing cost of extraction led to a long, slow decline in the Copper Country’s mining economy, ending with the closure of the last mines at the end of the 1960s. When mining activity ceased, the entire region became a vast industrial archaeology site, a relict landscape. Today, with the population a fraction of its historical peak, the Copper Country’s economic base has largely shifted to service and tourism; local identity remains closely tied to Keweenaw’s mining heritage, however, and the area attracts visitors as much for its mining history as for its natural beauty. The Keweenaw Time Traveler benefits from the richness of historical data found within its geographic area of focus. The largest historical copper mining companies in the region, such as the Calumet & Hecla and Quincy mining companies, were among the great industrial giants of their day; the scale of their enterprise required a vast industrial infrastructure along with company towns to house their workers, all of which had to be designed, built, and paid for. As a result, most of the towns and large mining locations in the Copper Country are extraordinarily well-documented in the form of an extensive body of Sanborn fire insurance plans (FIPs), company-produced maps with detail that even surpasses FIPs, plan drawings and blueprints. In an age of corporate paternalism and scientific management practices, mining companies also extensively documented the lives of their workers and their families; the KeTT team has begun the digitization of an unprecedented wealth of detailed records on company housing, employee records and health records that provide far more information than standard census data. These are combined with decennial census data from the Minnesota Population Center, business and phone directories, and school records to provide a uniquely detailed look at the history of an entire region down to the level of the individual over the course of a century. 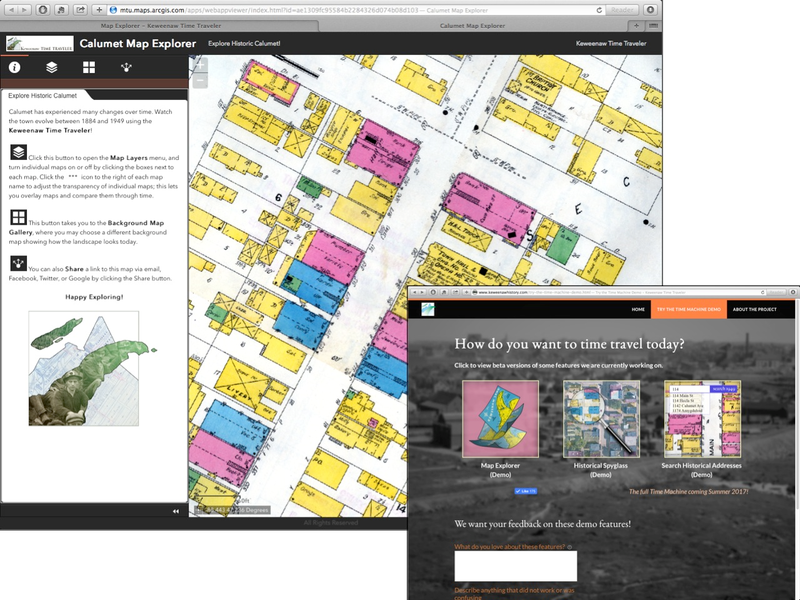 The core of the project is the Copper Country Historical Spatial Data Infrastructure (CC-HSDI), a next-generation implementation of HGIS designed to better facilitate both quantitative and qualitative research, while also fostering public engagement with both local history and the concept of HGIS itself. Using ArcGIS Desktop, ArcGIS Server and a PostgreSQL geospatial database, the CC-HSDI contains a series of ESRI Map Services consisting of georeferenced maps or FIPs broken into a series of time slices roughly equating with census years (in addition to smaller collections of maps from other years). Building these map service presented an early challenge to the KeTT team, as the size of each map service (representing a single town in a single year) ran into the tens of gigabytes and required the establishment of a dedicated PostreSQL geospatial-enabled server at Michigan Tech. Subsequent expansion of the HSDI will require these services to migrate to an off-premises enterprise-scale server facility (Amazon AWS) in the near future. The historical built environment of each time slice in the CC-HSDI is then hand-digitized from the map services, resulting in over a hundred thousand building footprint polygons (as well as roads, rail lines and a few other infrastructural components). These polygon shapfiles serve as the geographical anchor point for all of the CC-HSDI’s non-map-based historical data mentioned previously and constitutes the “built environment stage” of the HSDI (after Lafreniere and Gilliland, 2015). This stage not only includes the building footprint itself, but other relevant data transcribed from the FIPs including the spatial arrangement, street address, and number of stories for each building. Linked to the built environment stage geodatabases are non-map sources including data from the nearest census, business directories, phone directories, and company and school records. These records capture the social environment of each time slice in incredible detail, including whether a primary school student was immunized, or the medical profile of mining company employees. Coupled with the census data and business directory data that are already staples of HGIS, this “social environment stage” (after Lafreniere and Gilliland, 2015) not only represents a step forward in the ability of HGIS to contribute to qualitative research on past social environments, but provides the public with a wealth of local information that fosters a personal connection with the HGIS. The KeTT prototype web apps, developed in ArcGIS Online Web AppBuilder, allowed the team to gain valuable experience in developing requirements for the forthcoming full public launch of the KeTT Project. The KeTT project has emphasized public outreach and involvement as an integral part of the construction of the HGIS, not just its dissemination or end use. The team has reached out in several ways to accomplish this. Last summer’s GRACE program served as an early example of what the KeTT project could achieve. The G.R.A.C.E. Project — (GIS Resources and Applications for Career Education project) is a NSF funded collaboration between Dr. Yichun Xie, PhD, Professor/Director at Eastern Michigan University’s Institute of Geospatial Research and Education, Dr. Don Lafreniere at MTU’s HESAL, Michigan’s Virtual University, and several statewide professional GIS organizations to provide hands-on training in the use of GIS to students and teachers in economically disadvantaged communities. Last summer, the GRACE project partnered with the Keweenaw National Historic Park to bring GRACE to the Copper Country. Interns recruited from local high schools joined the HESAL at MTU in Houghton, Michigan to digitize major portions of the KeTT’s built environment stage from Sanborn fire insurance plans. During the course of the internship, GRACE students not only learned resume-building GIS skills, but also explored the history of their local community at a level of detail few people have access to. At the end of the internship, interns used ArcGIS Online StoryMaps to share portions of their local history they found most interesting during their work with members of the public. The KeTT team found the GRACE project to be a great way to involve the local community in ways that provided real benefit, and to generate some publicity in the process. The GRACE project took high school students into the lab and field, helping to build the Copper Country HSDI while also using it to explore the historical built environment of their local community and, ultimately, to share their experiences through public presentations. While a lot has been accomplished thus far, The KeTT project is just warming up; we plan to “go live” this spring, replacing the current beta web apps on the project website with the final, custom-programmed web apps that allow the public to explore, interact with, and contribute to the Keweenaw Time Traveler. 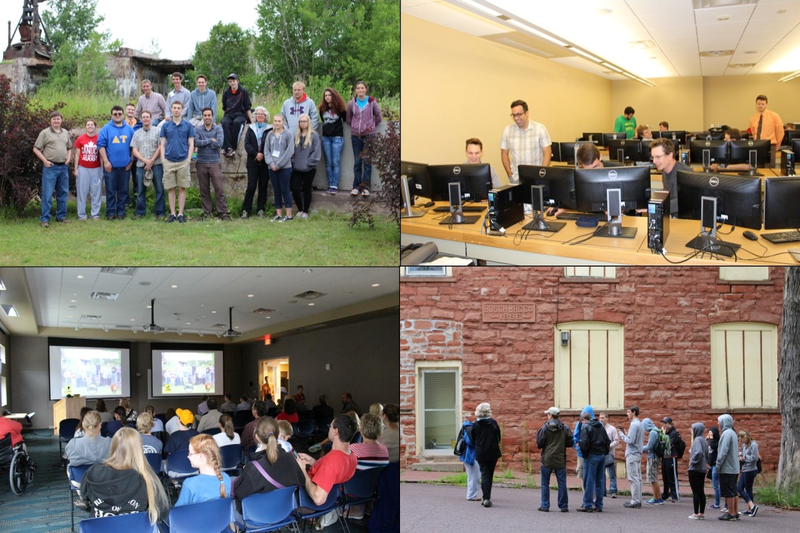 The release of the final apps will coincide with a new season of KeTT team outreach activities in partnership with Keweenaw National Historic Park and Keweenaw Heritage Sites to spread awareness of the project and provide public outreach. In addition to the ongoing GRACE project, we will be bringing custom-built touchscreen kiosks to numerous public events around the Keweenaw that allow people to use the KeTT web apps with the help of KeTT team members and partners. Stay tuned at www.mapyourhistory.org! Gregory, I. N., & Geddes, A. (2014). Toward spatial humanities: Historical GIS and spatial history. Bloomington: Indiana University Press. Jung, J.-K., & Elwood, S. (2010). Extending the Qualitative Capabilities of GIS: Computer-Aided Qualitative GIS. Transactions in GIS, 14, 1, 63-87. Kwan, M.-P., & Ding, G. (2008). Geo-Narrative: Extending Geographic Information Systems for Narrative Analysis in Qualitative and Mixed-Method Research. The Professional Geographer, 60, 4, 443-465. Lafreniere, D., & Gilliland, J. (2015). “All the World’s a Stage”: A GIS Framework for Recreating Personal Time-Space from Qualitative and Quantitative Sources. Transactions in GIS, 19, 2, 225-246. Olson, S., & Thornton, P. A. (2011). Peopling the North American city: Montreal 1840-1900. Montreal: McGill-Queen’s University Press.